Speed matters on the web. This is particularly true on the mobile web, where bandwidth and attention spans can both be in seriously limited supply. Slow pages can send users running to our competitors and anything that can speed up our pages has to be a good thing… doesn’t it? Google announced AMP, or Accelerated Mobile Pages, at the beginning of October and gave us the promise of lightning fast load times on mobile devices. The initiative is new, but already being adopted by a number of publishers and technology provider. With names like Google, WordPress, Pinterest, LinkedIn and Twitter backing the initiative, Accelerated Mobile Pages have the potential to be a game-changer. This isn’t WAP 2.0 though. AMP allows for rich content. Graphics, animation and video are all supported. Text will be loaded first, with images following and rich content and scripts only loading once the essentials have been handled. Thanks to some clever pre-loading and multi-threading techniques this all happens faster than you might expect. The results are impressive. In tests, AMP pages are loading up to 85% faster than their full equivalents. So AMP are like Facebook Instant Articles and Apple News then? Yes… no… well, sort of. The end goal is similar: Slimmed down mobiles pages that load in an instant. The key difference, for publishers, is that AMP pages live on your server on the open web rather than being created within Facebook or Apple’s wonderfully manicured, but highly walled gardens. The fast mobile offerings from Facebook and Apple have undoubtedly been motivators for Google to pursue AMP. Both competing technologies keep users with their walls, removing the need to visit the open web. Google, of course, has a vested interest in ensuring that the user experience of the open web doesn’t fall behind in-app alternatives. The web is Google’s natural habit and where it dominates. It’s only when users are on the web that they generate the data and the ad impressions that fuel Google’s business. AMP is also Open Source (although very much still a Google project) and open to all. No application process or approval, and any technology provider can build their own integration. In short, AMP is a technology for publishers whereas Facebook Instant Articles and Google News are business deals open to publishers (or some publishers, in the case of Facebook). How does this impact ad publishers? Love them or loath them, ads pay for most commercial content on the web and all three platforms acknowledge the essential need for publishers to monetize their content through ads. Both Facebook and Apple’s platforms allow publishers to run ads through their proprietary platforms, taking a 30% cut on inventory that they fill. AMP allows publishers to run their own ads, including through ad networks competing with Google. Currently, support is in place for ads through A9, Ad Reactor and AdTech by AOL as well as Google’s two networks (AdSense and DoubleClick). As AMP is open source I’d expect to see others joining that list quickly, but even without them that is a strong initial lineup that should help push revenues. It’s worth noting that AMP doesn’t prevent ad blocking. Several early articles on AMP described Accelerated Mobile Pages as “Google’s response to ad blocking” and seemed to suggest that ad blocking will be prevented. This is not the case. AMP certainly does prevent most ad tech from running on pages, which will be good news to those with privacy concerns around ads. However, the initiative certainly doesn’t read as a counter attack to the rise of ad blocking. Being backed by Google, there should not be any surprise that AMP will also support Analytics. If you are a WordPress user then the good news is that there is already a plugin that will do it for you. Simply install the plugin and AMP versions of your pages will be automatically produced. Careful to check your canonicals, as these are additional pages with the potential to introduce a whole new way for publishers to mess up their indexing. It’s free, open source and makes things lightning fast. What’s not to like? Although AMP sounds like a win for everyone, there are some serious criticisms being levelled at it. With Google having backed responsive design so assertively over the last few years, site owners might rightly be less than enthusiastic about now rolling out “mobile only” pages in the form of AMP. Worse still, publishers could be looking at producing pages for responsive and AMP in addition to content in Apple and Facebook’s proprietary formats. The biggest criticisms though are that AMP is essentially a fork of HTML that has been decided by a private company. The battle for HTML standards has been a long fought one and AMP effectively undoes much of that work, replacing tags like IMG that have existed for decades. Having decades of work undone by a web giant like Google has understandably upset many in the web standards community. What every SEO is wondering: Will AMP impact rankings? Google have said that its algorithms will not favour AMP pages in organic search results. They did although though remind us that page speed is already a factor in search. In short then “No, but they’ll likely do better anyway”. When will AMP be live in the wild? 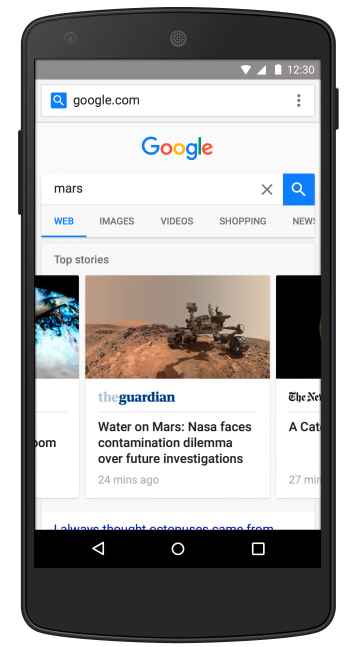 Google already has a demo of its search running AMP (Visit this link on a mobile device for more information – be sure to read the resulting page). The promise is that they will start sending traffic to AMP pages “early in 2016”, which should keep a few developers and SEOs busy over the Christmas period.